There was a swish of thrasher feathers through the scrub as I walked along a side trail near the area where Embudito Canyon narrows. A few minutes later it started to sing, and then another Curve-billed Thrasher popped up. I was between the two of them. 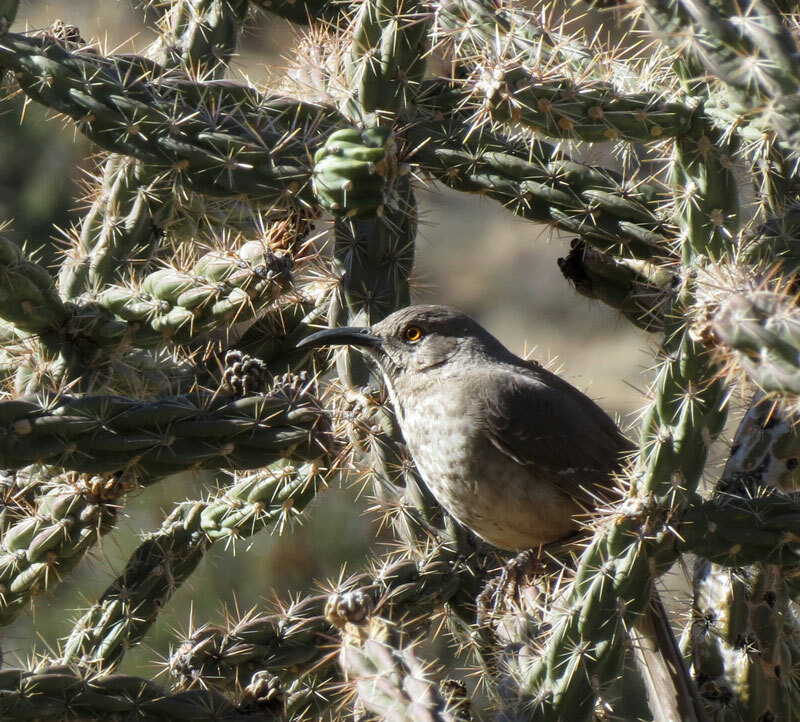 I stepped out of the way and she flew over to join the gurgling male and they snuggled next to each other on a cholla cactus. Even though a pair remains together as long as they are both alive, this cuddling behavior signals the beginning of the nesting season. 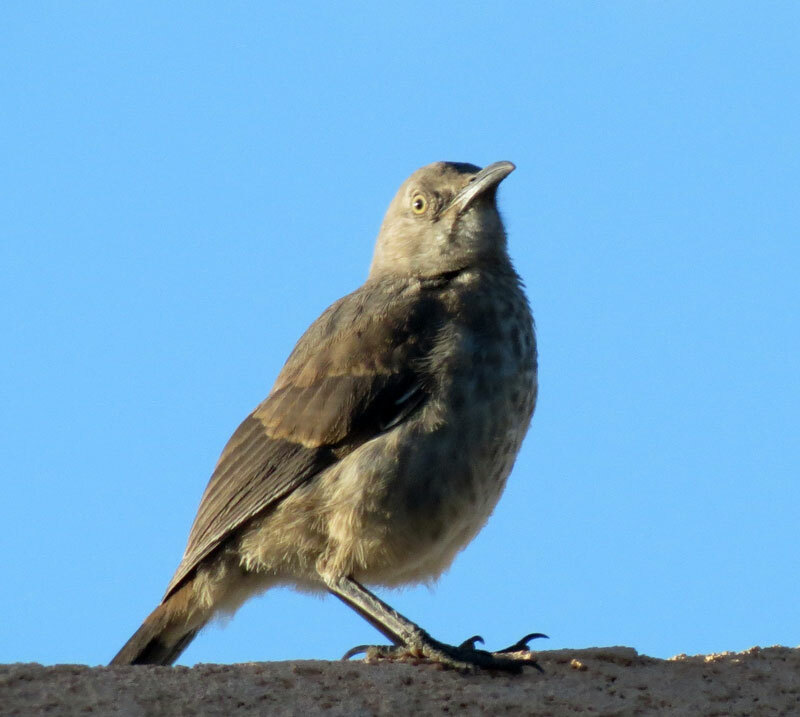 The Curve-billed Thrasher was my epiphany bird – when I realized that not all of the birds visiting my yard were LBJ’s (little brown jobs). It’s curved bill and beady yellow eye enthralled me – and I have been hooked ever since. I have not found the nest site; however, the male seems to prefer roosting in my neighbor’s pyracantha bush and calls from the nearby ash tree. Since pairs maintain their territory for the entire year, the female’s roost must be close by. 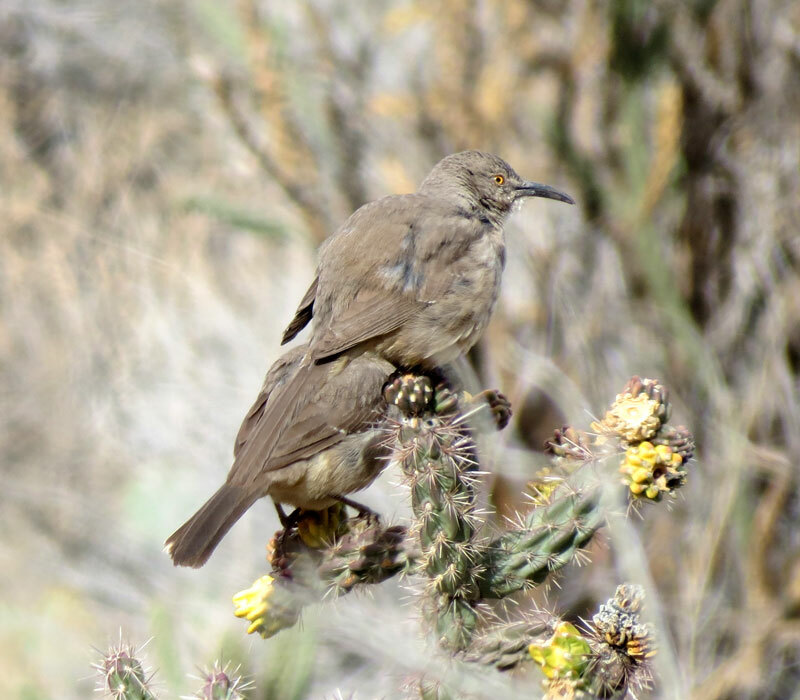 My favorite spot for observing Curve-billed Thrashers is Embudito Canyon, a featured site in Birding Hot Spots of Central New Mexico. 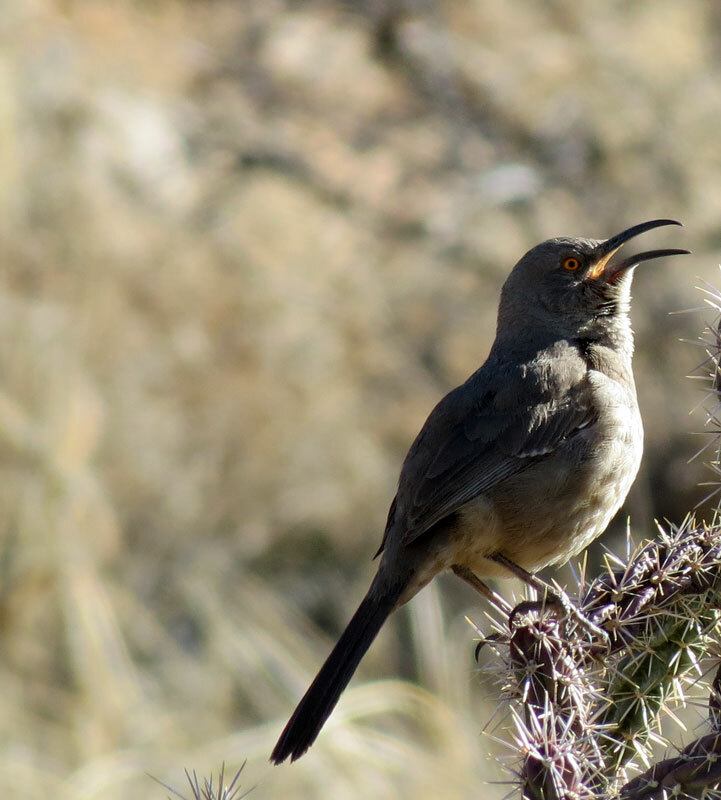 By mid-March the canyon is alive with rich melodic songs bubbling up throughout the area. 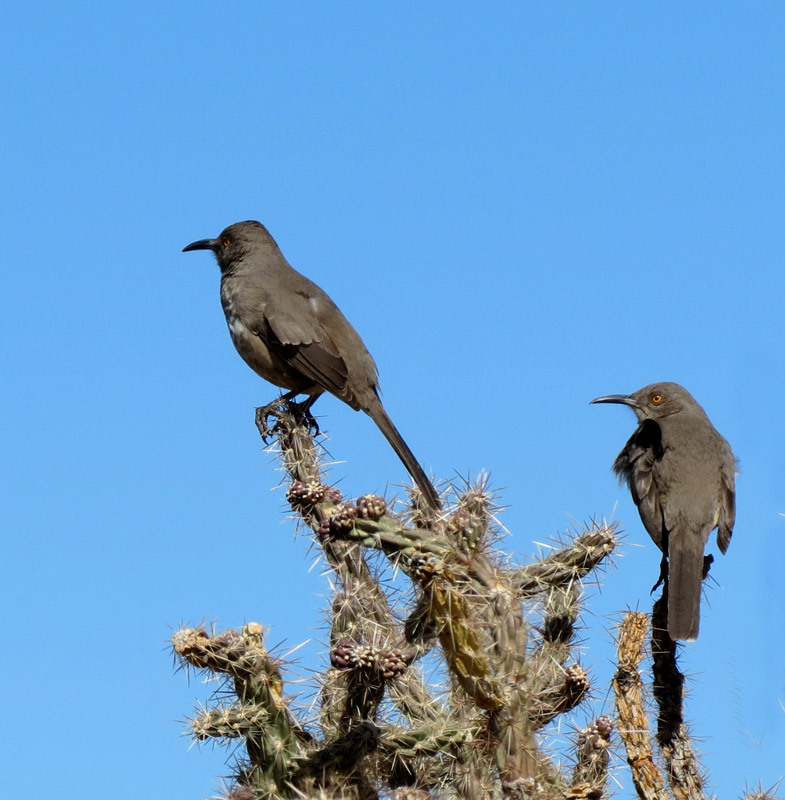 While singing, the male perches atop a cactus branch. And, then it will dive down into the cactus or underneath. 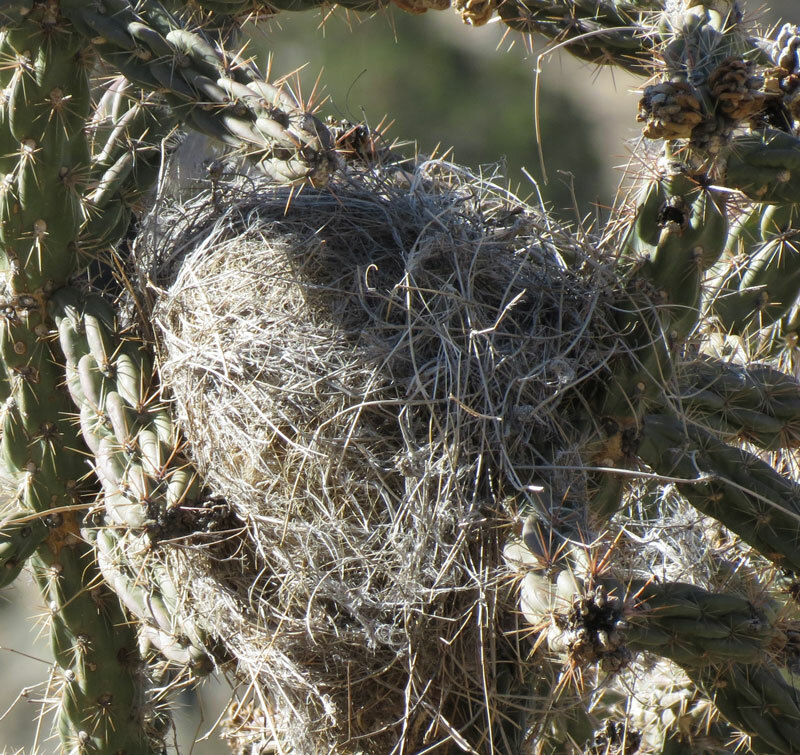 By early April, tightly woven cup nests appear in the cholla. Since only the tip of her bill and tail is visible over the top of the nest, it is very difficult to spot an incubating female. However, when the female is sitting on the nest, the male is often perched nearby. The incubation period last approximately 12 days. The mom then broods the young birds for another two weeks. 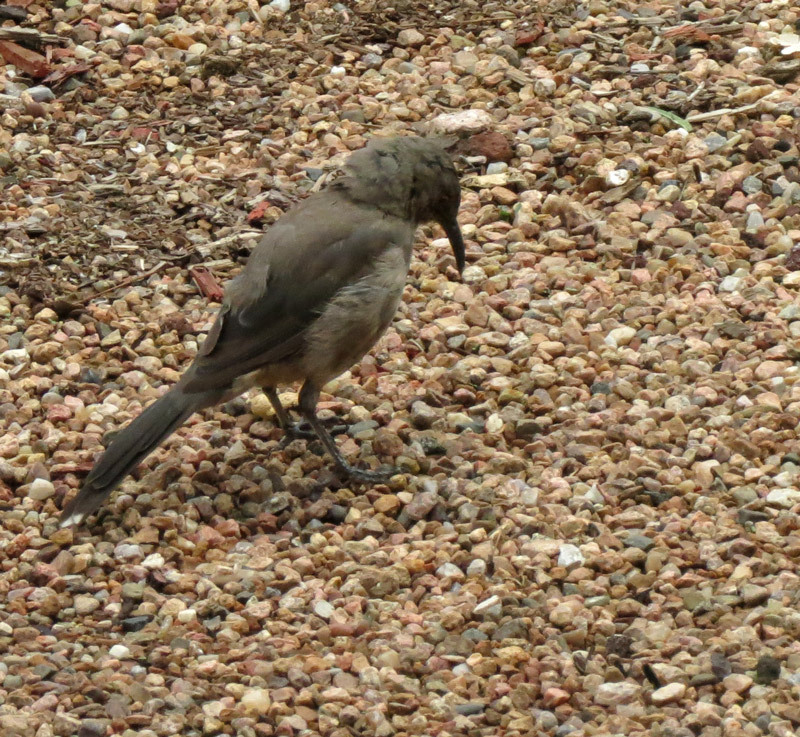 when the male introduces them to the peanuts I scatter on the ground and shows them how to spear the peanut with its bill and pound it against the gravel to crack the shell open. At this stage, the young bird is still begging and dad delivers pieces of nut to the offspring. The bill of the young bird is shorter and less curved than an adult and its feathers are slightly darker. During this period of time, I get excited emails from friends letting me know they have a Bendire’s Thrasher in their yard. As soon as the young are able to forage on their own, the pair begins construction of another nest for a second brood. The Curve-billed Thrasher continues to delight me year after year.